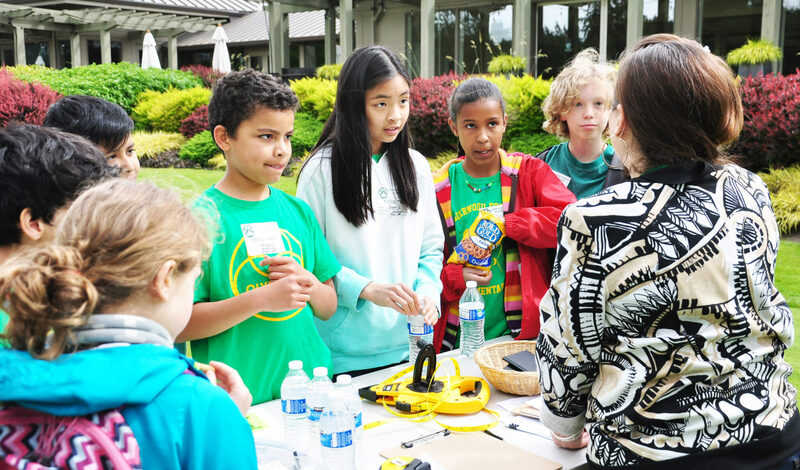 On May 30, Irán Mederos Vazquez and her fifth-grade class from Sherwood Forest Elementary in Bellevue, Wash., came to Glendale Country Club in Bellevue, Wash., for the first-ever First Green field trip – conducted in Spanish. First Green, an innovative environmental education outreach program using golf courses as environmental learning labs, is offering its most popular learning activities in Spanish. Soils and three different math activities were professionally translated and reviewed by Spanish-speaking golf course superintendents and those resources are now available for everyone. Sherwood Forest is one of the Bellevue School District’s dual-language schools, teaching students in both Spanish and English. Toni Marquez, a retired teacher from Puesta del Sol, another of Bellevue’s Spanish immersion schools, led the Soils activity. Maya Stevens, teacher at Bellevue’s Cherry Crest Elementary, taught the Math. In the third learning station, students got to putt. “Maya and I are so excited to help bring this hands-on learning to more students. It’s always a challenge to connect in-class learning with the real world. First Green makes that connection,” says Marquez. The lessons and field trip were made possible by a grant from the United States Golf Association (USGA) as well as additional support from Washington State Golf Association and Golf Course Superintendents Association of America. “The USGA has supported First Green for a number of years. Golf is a universal sport. As they conduct their first ever field trip in Spanish, this event dovetails with USGA efforts to expand the diversity and inclusion in golf,” says Dr. Kimberly Erusha, managing director of the USGA’s Green Section department. The USGA grants over the years have enabled First Green to develop new materials and programs and expand its reach.